Burlington is the most populous city in the U.S. Kick off your visit on the 27th (Sat): see the interesting displays at Shelburne Museum and then hike along Burlington Bike Path. For maps, more things to do, other places to visit, and other tourist information, you can read our Burlington online trip planner . Montreal, Canada to Burlington is an approximately 2-hour car ride. You can also take a bus. In July in Burlington, expect temperatures between 32°C during the day and 19°C at night. Wrap up your sightseeing on the 27th (Sat) early enough to drive to Portsmouth. Portsmouth is a city in Rockingham County, New Hampshire, in the United States. Start off your visit on the 28th (Sun): get engrossed in the history at Strawbery Banke Museum, see the interesting displays at USS Albacore Museum, then visit a coastal fixture at Portsmouth Harbor Lighthouse, and finally kick back and relax at Hampton Beach State Park. To find reviews, traveler tips, where to stay, and more tourist information, read our Portsmouth journey planning website . Getting from Burlington to Portsmouth by car takes about 4 hours. Other options: take a bus; or do a combination of bus and flight. July in Portsmouth sees daily highs of 32°C and lows of 20°C at night. Finish your sightseeing early on the 28th (Sun) to allow enough time to drive to Ogunquit. On the 29th (Mon), appreciate the extensive heritage of Marginal Way Walkway, then enjoy the sea views from Cape Neddick Nubble Lighthouse, then get outside with Fisherman's Walk, and finally enjoy the sand and surf at Long Sands Beach. 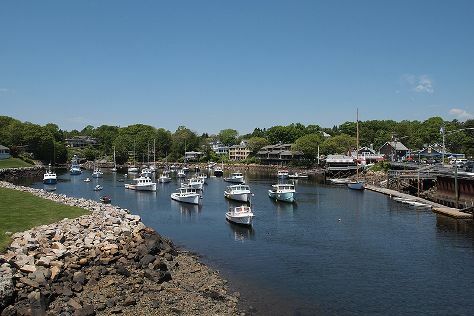 Get ready for a full day of sightseeing on the 30th (Tue): explore the striking landscape at Perkins Cove, tour the pleasant surroundings at Ogunquit Beach, and then kick back and relax at Wells Beach. To find traveler tips, photos, ratings, and tourist information, go to the Ogunquit trip maker website . Ogunquit is just a stone's throw from Portsmouth. Traveling from Portsmouth in July, expect a bit cooler with lows of 17°C in Ogunquit. Cap off your sightseeing on the 30th (Tue) early enough to go by car to Portland. Kick off your visit on the 31st (Wed): take advantage of the amenities at Old Orchard Beach, examine the collection at Portland Head Light, and then admire the masterpieces at Portland Museum of Art. For reviews, more things to do, other places to visit, and tourist information, read Portland vacation planner. You can drive from Ogunquit to Portland in an hour. Alternatively, you can do a combination of taxi and bus; or take a train. In July, plan for daily highs up to 30°C, and evening lows to 19°C. Finish up your sightseeing early on the 31st (Wed) so you can go by car to Bar Harbor. Bar Harbor is a town on Mount Desert Island in Hancock County, Maine, United States. Get outdoors at Mount Desert Island and Acadia National Park. It doesn't end there: take your sightseeing to a higher altitude at Cadillac Mountain and identify plant and animal life at Shore Path. To see more things to do, traveler tips, photos, and tourist information, go to the Bar Harbor day trip app . You can drive from Portland to Bar Harbor in 3.5 hours. Alternatively, you can take a bus; or do a combination of bus and flight. In July, daily temperatures in Bar Harbor can reach 28°C, while at night they dip to 17°C. Cap off your sightseeing on the 3rd (Sat) early enough to travel back home.